We are two girls blogging about things that spark our interests, anything from fashion to food, traveling, books we love, and everything in between. We met through family friends in Indiana when we were just 11 years old. Before we were old enough to drive and before emails and the internet existed, we used to be pen pals. 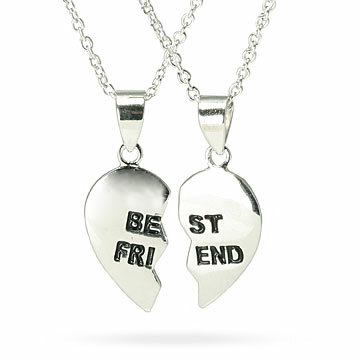 We would send each other cute little stickers and those half-heart necklaces that say “Best Friends”….you know….the ones where one side says BE FRI and the other says ST END. So it’s the real deal. We’ve lived across the country from each other, in neighboring states, in the same state and have always kept in touch and have been in each other’s lives. True friendship is the best, isn’t it? Come along on our adventures, we love meeting new people! Awesome blog! I’ll be coming back to read more! Thanks so much Erin, so nice of you! Thanks for the support! Sending our blog love right back at you! Thank you all so much for the continued love and support of our blog. We love blogging and we love the supportive and kind community that is WordPress. Real friends are hard to find. More power to your friendship and may you have an awesome adventure ahead of you! Couldn’t agree more. True friends are hard to find these days, so if you find one don’t let them go. Oh my gosh, I remember those friendship necklace : ) but instead of a necklace I’ve got my girly some friendship mood ring. You guys have a lovely blog! Hi, I love your blog! =) You girls have really good taste in everything girly! Thanks Christina, glad you like our blog! I checked out your blog as well and it’s so fun! I love the cartoons and quotes you always have, so cute. Thank you! Same here! =) Your blog is very girly and I’m happy I found it. Have a great day! Nice! I have a best friend that was exactly the same way – we met at summer camp while she grew up in OH and I in IL. We’re now states a part, but we’ll always stay close. 🙂 Looking forward to following your adventures! Nice! I’m from Barrington, while the bestie is from Oxford, OH. We both went to Miami University (MU is located in Oxford), but other than that we’ve always been in separate states, ha! Such a small world, love meeting other bloggers from Illinois! Wooo! So fun! I’m out in Colorado, but almost everyone out here came from the Midwest. Guess I’m kind of cheating the system, baha! Hah! My boyfriend and I have been trying to move to Colorado for years, but work keeps pulling us in different directions. We’ve lived in DC, California and are moving to Seattle next. Are you loving it out there?? Haha! I am! We were living in Chicago and I was going to quit my job anyways. Fiancé could move anywhere with his, so we just figured, why the heck not! It’s a TOTAL change of pace, but it was definitely a good move for us. 🙂 Though, be forewarned, everyone and their mom is moving out here right now, so it’s the hot thing to do, haha! I wanted to chime in and say hi to to Jessica from Barrington that lives in Colorado! I also went to Miami of Ohio, was from Illinois and now lives in Colorado. Small world!